A trend line (shortened to "trendline" elsewhere on this website) is simply a momentum indicator. It measures the rate of increase in the share price over time and alerts you to any acceleration or deceleration of the trend. The difference between trendlines and other momentum indicators is that you use a super-computer (the human brain) to visually identify the trend, rather than a simplistic formula calculated on your PC. 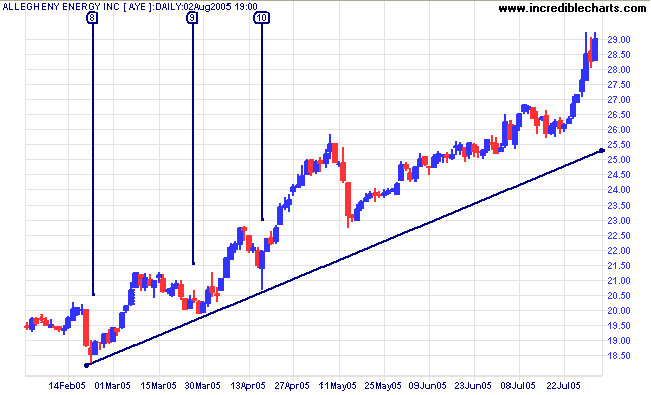 Trendlines should not intersect (cut across) price at any point on the chart if extended. Trendlines do not predict levels of support and resistance. Support and resistance run horizontally; not at an angle. For an explanation of the basics, see Support and Resistance. Many traders confuse the two concepts: the lower line in a trend channel is often referred to as the supporting trendline. 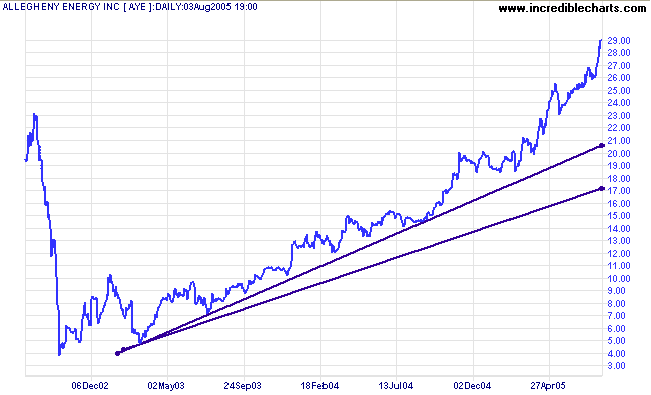 On a short-term chart (6 months or less), draw trendlines through the lows during an up-trend. And through highs during a down-trend. 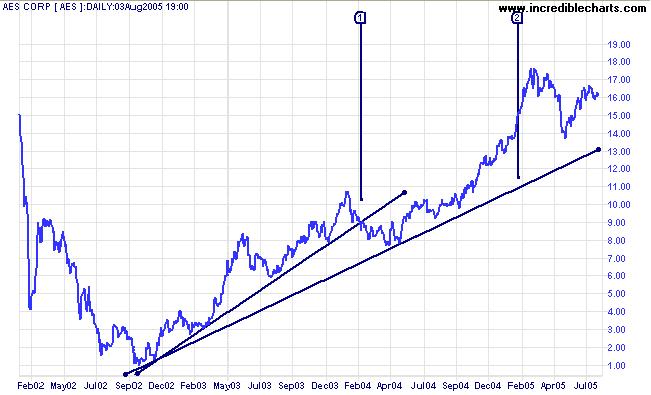 On a long-term chart, trendlines drawn with closing price are more effective. The lower trendline was drawn according to daily lows, to illustrate this point. There has been much debate on the Chart Forum over the years as to whether trendlines should be drawn on log scale or normal scale charts. Brokers and analysts chart in log mode. They advise institutional clients whose order flow has a marked impact on price action and trend. Their advice is heavily influenced by breaks and refusals of price at key trendlines and channels. These are based on logarithmic charts. 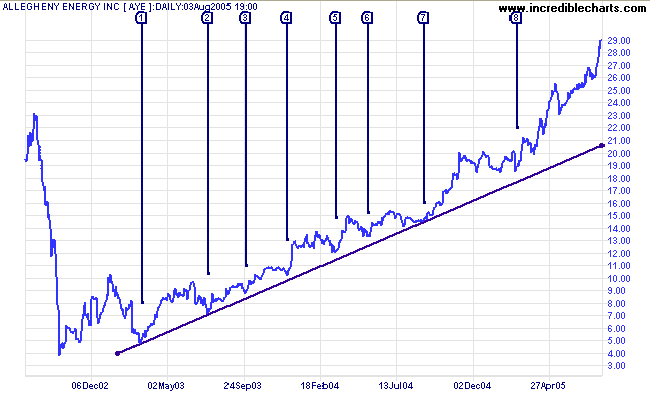 Logarithmic trendlines are, therefore, more important. Most trading authors use linear charts: Stan Weinstein, Alexander Elder, Chris Tate and Daryl Guppy. 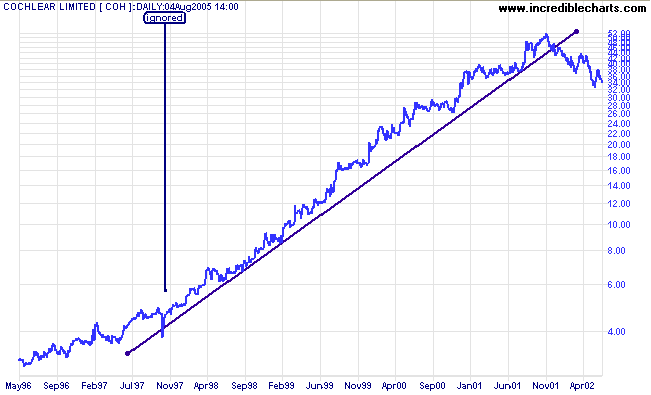 It is questionable whether most analysts and brokers use log scale charts. 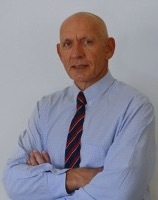 Many trading authors (including Stan Weinstein and Chris Tate) are former analysts or brokers and use linear charts. In my opinion the two sides are talking about different time frames! Normal scale charts compare price against time. You would graph the speed of a car in a similar manner: distance (y) over time (x). If a car travels at a constant velocity, the graph will be a straight line. If stopped, the line will be horizontal. If accelerating, the graph will show a curve. Log charts are not designed to measure velocity, they measure acceleration: the rate of growth in stock prices. A constant velocity will be depicted as a flattening curve; a constant rate of growth (acceleration) will be depicted as a straight line. In the short/medium term we focus on velocity: "Is this week's price increase as good as last week?" The time period is too short to be concerned with compound growth rates. Most institutions hold stocks for the long-term and do not concern themselves with short-term fluctuations. They want to know the annual compound growth rate; a very different concept from short-term velocity. What Chart Scale Should I Use? On short-term and medium-term charts (3 years or less) we recommend that you use normal scale. For long-term charts (more than 3 years), use either normal scale (linear) or log charts, but be aware of their respective strengths and weaknesses. 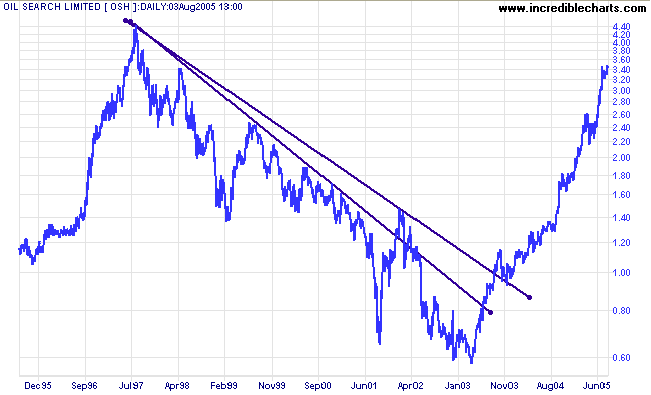 Personally, I prefer to draw trendlines on linear charts unless we are looking at a 10 or 20 year time period. Linear trendlines appear to accelerate over time if a stock grows at a constant compound rate. 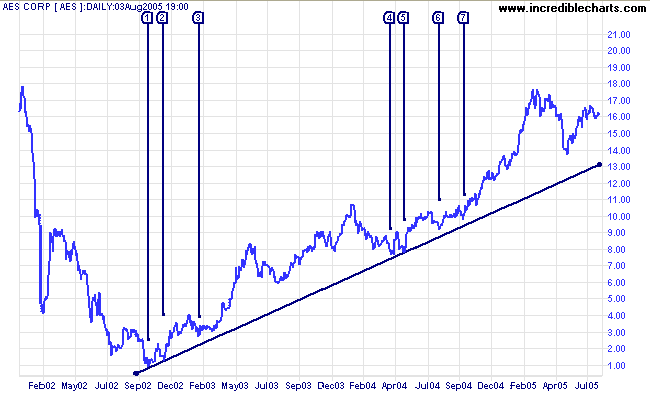 Logarithmic trendlines more accurately present the rate of growth (or decline) over very long time periods. Linear trendlines appear to decelerate over time if a stock declines at a constant (negative) growth rate. 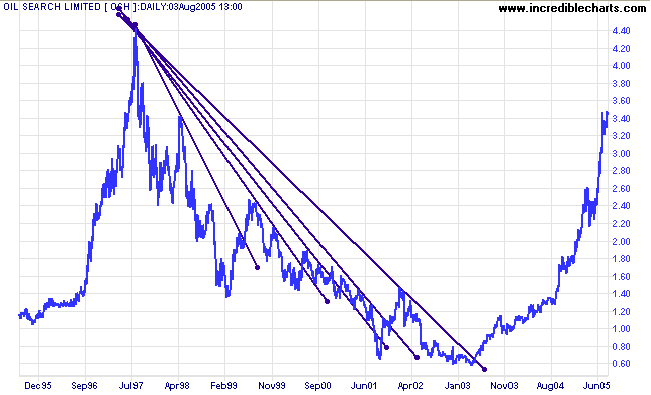 Logarithmic trendlines more accurately present the rate of decline. 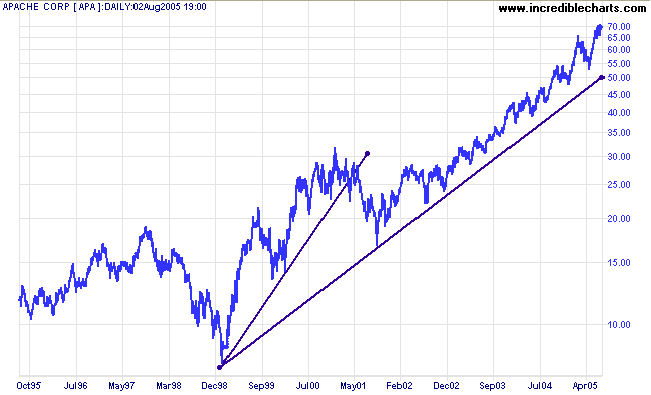 Logarithmic trendlines tend to disguise accelerating trends in the short/medium term. We are talking about accelerating trends rather than a steady growth rate. 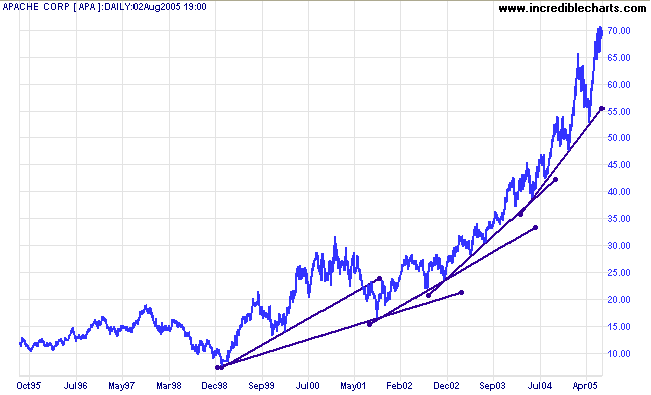 Accelerating trends normally end up in blow-offs (or cathartic sell-offs in a down-trend) followed by a sharp reversal. On a 3-year chart, normal scale highlights the accelerating trend. While log scale tends to camouflage (flatten) the acceleration. Let's take a look at some of the basics in more detail. What does close proximity mean? Price does not have to touch the trendline. Any reversal within a reasonable distance is good enough. On the 3-year chart below you can see that a number of troughs are short of the trendline, but within close enough proximity that they can be said to have respected the trendline. Short-term charts often display candles with long tails or shadows when stops are shaken out, or traders get caught in a false break, initiated by market professionals. 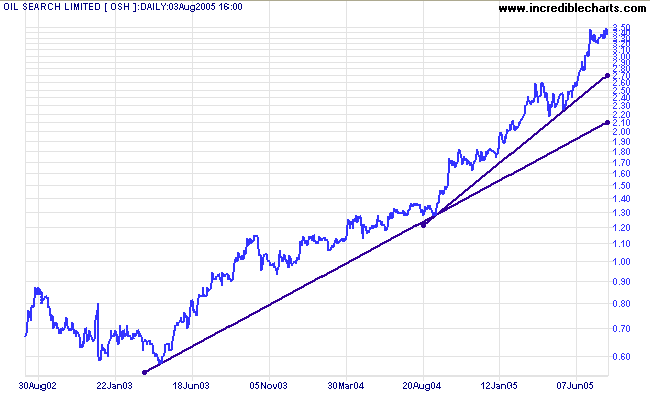 If the daily high or low gets in the way of an obvious trendline -- ignore it, but do not intersect closing prices. Trading was suspended, on the above chart, for two days in February. Longer suspension periods may distort trendlines and the results should be treated with caution. Avoid intersecting closing price except on a long-term chart if there is a spike that does not fit the overall pattern. And only do so in exceptional circumstances: the trend must really be obvious. 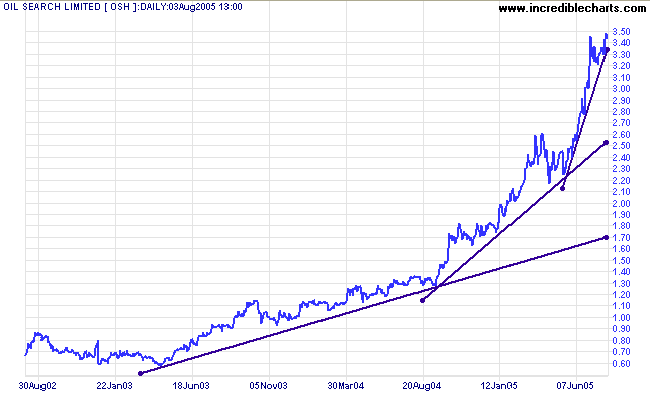 Trendline breaks signal a change in momentum; not necessarily a change in trend. Trendline breaks often look obvious with hindsight, but you will normally find that the trendline depicted was not the first one drawn: several trendlines may be broken before there is a trend reversal. When should Trendline breaks be acted upon? If trading short-term or swing trading, act upon trendline breaks when you receive price confirmation (or confirmation from another indicator), as you would for any other momentum indicator. In the longer-term, trendlines are an effective tool for exiting trends that have spiked into a blow-off (or down-trends that have spiked into a cathartic sell-off). A fast accelerating trend, or blow-off, is normally identified by at least 3 accelerating trendlines, each at a markedly steeper gradient than the previous one. Yahoo displays a classic example in 1999/2000. 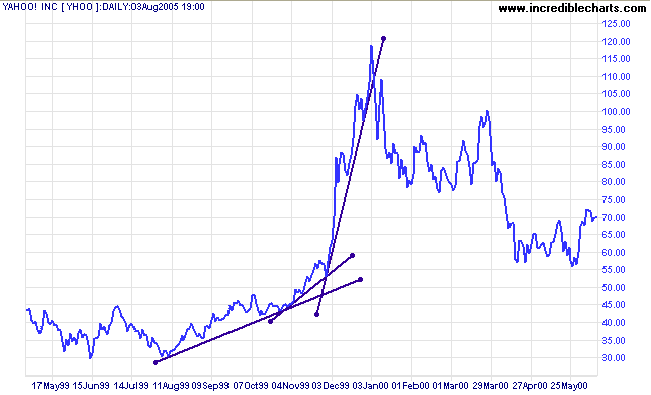 Normal trendline breaks on long-term charts should be treated as an alert rather than as a trend reversal signal. Price tests support at $8.00 several times before resuming the up-trend, establishing a second trendline at . Has trendline  above been confirmed yet? 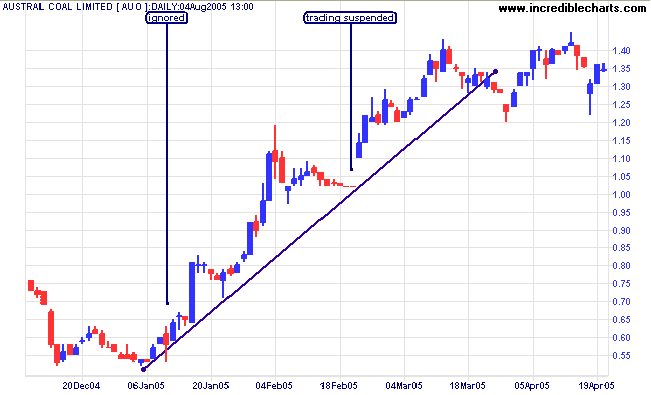 Hint: Valid trendlines must be respected at least three times. Yes. The trendline has been respected seven times. Possibly eight if we consider March 2003. Drawing trendlines is time-consuming and in most cases unnecessary. Use stock screens to identify the most likely candidates and concentrate on these. 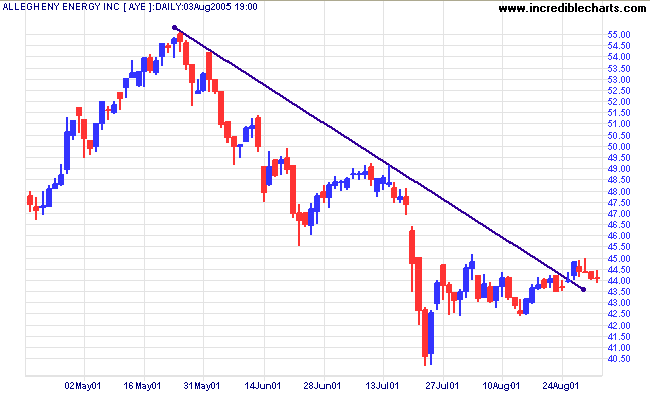 Following more than 20 stocks with trendlines is, in my opinion, a waste of time. You have to look at the wood not the trees! Draw trendlines through the lows in an up-trend and through the highs in a down-trend. Use closing price for longer-term charts (more than 6 months). Use normal scale for short and medium-term charts. Use either normal or log scale for long-term charts but beware of their weaknesses. Valid trendlines must be respected by at least 3 troughs in an up-trend (or 3 peaks in a down-trend) and should not intersect the closing price line if extended in either direction. Use trendlines as a momentum indicator for short-term trades but only as an alert on long-term trades. They are also an effective exit tool for blow-offs. Don't waste time drawing trendlines on every chart. They are time-consuming and should only be drawn on a handful of selected stocks.